Spanish scientists have established how natural products protect plants from sun damage. The compounds could be used as active ingredients in sunscreens. Using computational techniques on palythine - a compound found in coral - as a model compound, Diego Sampedro at the University of La Rioja, Logroño, investigated what happens to the molecule after it absorbs UV light. Sampedro found that when UV light was shone on palythine, the molecule rapidly dissipated the light energy into heat energy without forming reactive, harmful, photoproducts. He looked at the mechanism in detail on both the protonated and neutral forms of palythine, as scientists were unsure which form was active in the coral. He found that both forms underwent a bond rotation to transform light into heat energy, but the protonated form was responsible for the main absorption of the radiation. Palythine is a mycosporine-like amino acid (MAA), compounds present in organisms such as fungi, bacteria, algae and marine organisms. MAAs are thought to have a number of biological activities, including photoprotection. Although evidence for the latter has been circumstantial, they are being considered for use in commercial sunscreens. In order to aid their commercialisation, the mechanism of MAAs' photoprotective effect needs to be understood. Mike Robb of Imperial College, London, an expert in computational chemistry, praises the timeliness of the study. 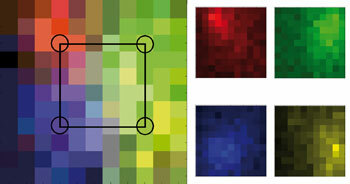 'MAAs are already being studied as industrial photostabilisers. Understanding the details of the mechanism should help in the design of such species,' he says. Sampedro is aware that there is much scope for further work and hopes to tune the absorption wavelengths of these molecules and to investigate the effects of structural modification on photoprotective ability. Scientists from Korea have found that with the use of graphene nanosheets, the fabrication of bendable power sources is possible. Electronic devices are no longer confined to the home or office. We travel with them, carry them around and even wear them. To make equipment like roll-up displays and wearable devices achievable, the power source that supplies them must also become more flexible. The major challenge of developing a truly bendable power source has been the shortage of material that is both highly flexible and has superior electronic conductivity. Polymers are typically used, but they can degrade at relatively low temperatures, which makes them less than ideal. Kisuk Kang from the Korea Advanced Institute of Science and Technology in Daejon, and colleagues, have developed a graphene based hybrid electrode producing a flexible lithium rechargeable battery. 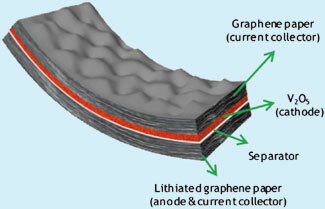 The cathode material, in this case V2O5, is grown on graphene paper using pulsed laser deposition and graphene paper coated in lithium is used as the anode. The resultant battery is lightweight and flexible enough to be twisted or rolled. The performance of the new battery is promising, says Kang. 'The electrode exhibits significantly improved electrochemical performance in almost all aspects of electrochemical properties, such as higher energy density, power density and better cycle life, compared with non-flexible conventional electrodes,' he adds. 'The gradient nanostructure is curious, and their approach to fabricating a flexible roll-up device is also promising for the next generation of energy storage,' comments Hiroyuki Nishide, an expert in functional polymers and their use in electronics from Waseda University, Japan. Kang hopes to extend the work to increase the battery's performance and long term stability, perhaps using a solid state or polymer electrolyte. He also believes that by combining this new technology with other functional materials, it could be used in applications such as catalysis, photovoltaic devices and organic light emitting diodes. A digital compact disc integrated with a microfluidic device to analyse cells has been developed by scientists in the US. The disc can be inserted into a standard computer disc drive for analysis and could be used to diagnose diseases. 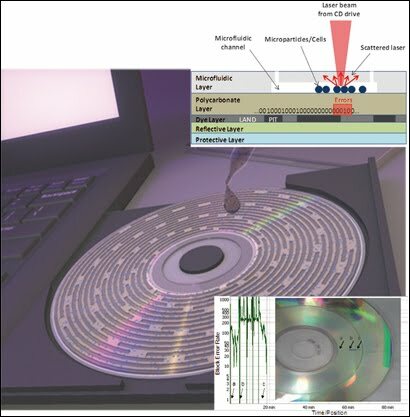 Gang Logan Liu and coworkers at the University of Illinois at Urbana-Champaign built a layer onto a CD that converts biological information into digital information to detect the presence of cells and their size and number. Blood cell counting and sizing are often standard medical practices in the diagnosis of diseases such as leukemia, anemia and Aids. A lack of rapid, accurate and affordable cellular diagnostic equipment in remote areas, on battle fields and in third world countries inspired the invention, says Liu. 'By using a microfluidic powered compact disc device similar to a music CD, we can transform computers into powerful, highly sensitive and low cost cellular diagnostic equipment, so that medical workers only need a portable computer and a few CDs to diagnose diseases,' he adds. The team made the device by burning an audio file consisting of a repeating sequence of binary numbers onto a CD's surface. On top of this, they added a microfluidic layer with a channel. They injected small fluid samples of cells into the channel and focused the laser beam from a CD drive onto the disc's data layer, which reads the binary code. Any particles on the layer interfere with the laser beam, interrupting the code and altering the data readout in graphs of error against time. The size of the response correlates with the cells' shape, concentration and optical density. In the future, Liu hopes to develop the next generation of digital microfluidic compact discs to analyse biofluids such as blood and urine. He expects to face some challenges including controlling accurate optical analysis, digital information decoding and cell suspension fluid dynamics on the CD. Researchers in the US and Germany have synthesised and characterised an iron nitride compound that reacts with water to produce high yields of ammonia under mild conditions. The work could help elucidate the mechanisms behind iron-based catalysts, both for industrial and biological ammonia production, which could allow for cheaper non-toxic catalysts. Chemists have previously proposed iron nitride intermediates that might play key roles in the catalytic conversion of atmospheric nitrogen to ammonia, a commercially important reaction for the production of fertilisers and drugs. There have been reports of iron(IV) and iron(VI) compounds, as well as some spectroscopic results for an iron(V) nitride. However, obtaining both the structural and spectroscopic evidence has remained a challenge owing to the fleeting nature of these compounds. 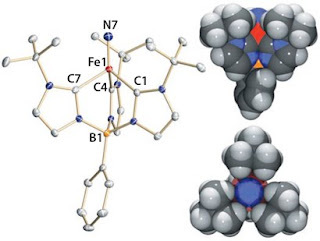 Now, Jeremy Smith's group at the New Mexico State University in Las Cruces, US, and Karsten Meyer's group at Friedrich-Alexander-University of Erlangen-Nuremberg, Germany, have generate the first direct evidence of an iron(V) nitride complex existing as a stable solid compound. What's more, it is highly reactive, producing high yields of ammonia at -78°C, a relatively low temperature for catalysis, using water as a proton source. 'This is the first time anyone has shown by a combination of structural and spectroscopic methods that iron(V) does exist,' says Smith. 'This is important for people who are investigating mechanisms of metalloenzymes.' He adds that before now it was more difficult to believe proposals of iron(V) compounds as a reactive intermediates. 'Ten years ago, if someone had told me that a chemist was going to isolate a pure iron(V) compound, I would have said it would be impossible,' says Patrick Holland, who studies the interactions of iron with N2 at the University of Rochester in New York, US. 'Even though the iron nitride in this paper is not closely related to ones in commercial ammonia production, the unprecedented stability of iron(V) is a significant achievement'. Using x-ray crystallography, Smith's group obtained the structural details of the complex at the atomic level, while Meyer's group used spectroscopy to determine its electronic structure. Once they knew where the electrons were in the complex, they were able to determine the oxidation state of the iron. A nitride (N3-) ligand bound to an iron centre would usually be extremely unreactive and require very harsh conditions, such as strong acidity, to react. 'Our results show that, in the right environment, an iron nitride can make ammonia from water, which is surprising given this precedent of very low reactivity,' says Smith. Compounds found in seaweed have shown anti-malarial properties, killing even drug-resistant malaria parasites. Many drug molecules are natural products, including quinine, arguably the 'original' anti-malarial, which comes from the bark of the cinchona tree. This has driven scientists to search for new compounds in all corners of the natural world. 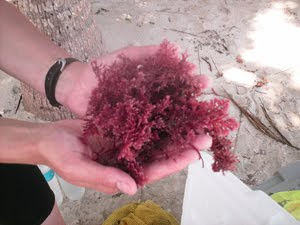 Now, Julia Kubanek at Georgia Institute of Technology, US, has shown that large macrocyles from Fijian red seaweed could lead to new drugs for the treatment of malaria. She presented her work at the annual meeting of the American Association for the Advancement of Science. The compounds, called bromophycolides, were first isolated in 2005, and researchers have since proved they have moderate activity against cancer cell lines. But it was during a recent collaboration with cell biologist Karine Le Roch at the University of California, Riverside, that the bromophycolides were tested against malaria. 'We thought wow, maybe there is something here after all' says Kubanek. When added to infected blood, bromophycolide A concentrates in infected cells and kills the parasite, while leaving healthy cells unharmed. It does this by preventing crystallisation of heme, which is a waste product of the malaria parasite. Heme is toxic to cells, and usually the malaria parasite crystallises it into hemozoin, a non-toxic form. Bromophycolide A disrupts this process. At the moment bromophycolide A is not as potent as artemisinin, currently the most commonly used anti-malarial. But Kubanek and other researchers elsewhere are now working to find more effective variants. In Kubanek's lab, the purified natural product has already been modified. Meanwhile, over in the chemistry department, colleagues are working on the total synthesis and more targeted variation. 'What we really know is that these compounds are able to kill malaria in 96 well plates,' says Kubanek. 'But we need to show that the drug could work in a mammal.' Therefore, next week, work will start with animal models, with hopes for a more potent analogue from the chemistry lab to use soon. US scientists have created a model of the ring-shaped networks of neurons in the brain, which could help researchers to understand small changes within diseased brain cells. 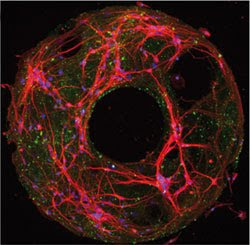 Henry Zeringue, and colleagues at the University of Pittsburgh, developed the model to enable the study of brain circuitry in an in vitro system instead of using brain slices. In the brain, neuronal networks make up the cortex, which is responsible for holding traces of memory for short time periods. The cortex does this using persistent activity in the network, which can last from milliseconds to seconds. In neurological diseases, such as Alzheimer's disease, subtle changes in this activity take years, or even decades, to become clinically detectable. Most studies only explore the electrical properties of a single neuron or the connection between two neurons. Until now, there hasn't been a good model to study network activity in vitro. 'We have decades of knowledge on molecular mechanisms underlying synaptic control [synapses allow neurons to pass an electrical or chemical signal to another cell], along with knowledge from brain imaging. What is missing is an understanding of the network-level control,' explains Zeringue. Zeringue's team stamped proteins onto glass substrates in a ring shape. Rat neurons were grown on the proteins, making a network of 40-60 neurons. To test the neurons' ability to transmit a signal around the ring, the team used an electrical field to stimulate one of the neurons and followed the signal's progress. To do this, they injected a fluorescent dye into the system, which responds when transmitter molecules are released. They captured the signal's progress with a fluorescence detection camera and found that the signal continued around the ring for several seconds before a gradual decay. '[This work] is an excellent example of using simplified circuits to understand processes in the brain,' says Elisha Moses, an expert in the physics of complex systems at the Weizmann Institute of Science, Israel. Zeringue and his team are considering using their platform to characterise network-level changes based on small experimental perturbations, like changes in network geometry or expression of mutant proteins in 10 per cent of the neurons. 'Deciphering the relationship between the connectivity of the neurons and the activity in the ring culture will be challenging and unravelling the connections between the neurons may still prove to be a daunting task,' he concludes. Capsules coated onto electrodes could mitigate potential problems with lithium ion batteries by turning the batteries off when they overheat and 'healing' the electrodes when they crack and degrade, according to a researcher in the US. Scott White from the University of Illinois at Urbana-Champaign says that in his lab self-healing materials have inspired a new concept for battery safety and self-repair. Lithium ion batteries are already common in portable electronic applications, such as mobile phones, where their high energy density sets them apart from alternatives. And they are likely to become even more widely used as electric and hybrid cars grow in popularity. But they have some drawbacks. Most worryingly perhaps for consumers, the batteries can overheat and catch fire or explode. Another problem is the longevity of the batteries - the anode is degraded by successive rounds of lithium deposition and removal, and eventually the battery simply stops working. White says coating the electrodes with capsules could help in both cases. His solution to the safety problem involves capsules made of a surprisingly simple material: polyethylene. If the battery heats up 105°C, the capsules melt and the polyethylene covers the electrode, halting ion conduction and thereby shutting down the battery. His solution to the longevity problem is capsules that release 'healing' fluid. In this case, the capsules are more like eggs, with a brittle shell containing a liquid centre, a gallium-indium alloy. The same process that degrades the electrode shell causes the shell to crack, and this releases the liquid metal, which coats the anode and restores its function almost instantaneously. According to White, both these approaches could be integrated into the manufacture of batteries and would not add significantly to the cost. In addition, his work might be applied to other battery systems. 'This is a translatable technology that can be modified,' he adds. US researchers have shown how biodegradable, medically safe polymer coatings can help nanoparticles penetrate the mucus lining that protects human tissues to deliver drugs efficiently. 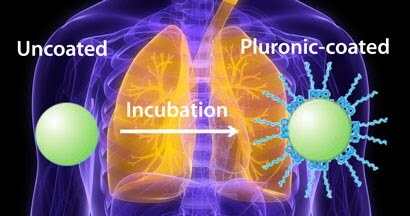 Mucus is an effective barrier to sustained local drug delivery at sites such as the lungs: large drug-releasing particles become trapped in the upper layers of the mucus and are rapidly eliminated; small drug molecules pass readily through the mucus but are then quickly absorbed into the circulatory system and removed from the locally diseased tissue. The team, led by Justin Hanes at Johns Hopkins University in Baltimore, focused on synthetic nanoparticles made from poly(lactic-co-glycolic acid), which has been approved for use in drug delivery. On their own, the particles do not penetrate the deep mucus layers and are quickly removed. The team had previously shown that coating particles with the uncharged hydrophilic polymer poly(ethylene glycol) (PEG) could significantly improve the particle's diffusion through mucus. However, attaching PEG requires a covalent bond, creating what regulatory authorities class as a new chemical entity, which needs expensive and time consuming tests for approval. 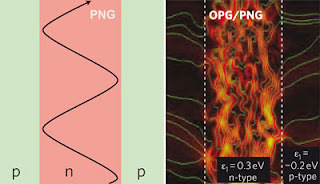 To get around this, the researchers incubated the particles with a copolymer consisting of two lengths of PEG sandwiching a segment of poly(propylene oxide) (PPO). These triblock copolymers, PEG-PPO-PEG, are known as Pluronics and are 'generally recognised as safe' by the US Food and Drug Administration. The hydrophobic PPO part of the copolymer adsorbs to the surface of the nanoparticle, leaving the PEG portions sticking out to coat the particle. Because the association between the polymer and particle is non-covalent, the system is not classified as a new chemical entity. Satyanarayana Somavarapu of the University of London's School of Pharmacy describes the study as 'excellent' and says that the improved rate of diffusion provided by simply treating the nanoparticle with Pluronics 'shows tremendous potential in overcoming one of the key barriers to nanoparticle delivery systems where there is mucus'. Nonsense mutations, which cause more than 1800 human diseases, are alterations in the genetic code that stop protein production prematurely, leading to truncated or nonfunctional proteins. 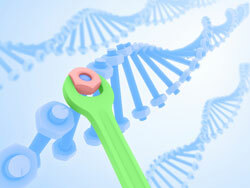 Gene therapy is one treatment, but it's had limited success. With suppression therapy, small molecules allow cells' protein producing equipment to skip over nonsense mutations to restore the proteins. Aminoglycosides - antibiotic amine-modified sugars - are the only clinically available drug family known to be effective in suppression therapy, but at effective doses, the compounds have high human toxicity. To reduce the toxicity, the team introduced a methyl group onto two aminoglycosides. They tested the new derivatives in an in vitro suppression test on six different nonsense mutations for different diseases and carried out toxicity tests on human cells. They found that the compounds exhibited significantly improved activity and reduced toxicity compared to gentamicin, an aminoglycoside antibiotic used to treat bacterial infections. 'Treating genetic disorders is one of the biggest challenges of modern medicine. The likelihood that suppression therapy could be used clinically is very feasible,' says Baasov. 'Our lead compounds are under intensive examination on numerous genetic disease models including cystic fibrosis, Hurler syndrome, Rett syndrome and Usher syndrome,' concludes Baasov. Researchers in the US have created nanopores that can capture, concentrate and shift molecules in predictable ways. The development - inspired by the waxy coating on insect antennae - could help to characterise proteins and membranes for therapeutic drugs. Nanopores are a type of sensor used for detecting nanoscale objects such as single proteins, DNA and the molecules involved in chemical and biological reactions. Unlike 'bulk' sensors, nanopores enable scientists to see static and dynamic variations that would otherwise be lost among numerous other processes. Several teams are working towards nanopore systems that can sequence individual DNA molecules. Yet they do have their problems: the pores can clog; they often cannot discriminate between passing objects; and they do not always let objects pass in a predictable manner - properties that are crucial for reliable sensing. Now, Michael Mayer of the University of Michigan in Ann Arbor and colleagues have found a way around these problems. They have been inspired by insect antennae, which have a waxy fluid lipid coating their surface to help detect airborne behavioural chemicals known as pheromones. Because pheromones bind easily to wax, nanopores on the insect antennae can capture and concentrate the pheromones and deliver them to the insect's nerve cells. Using this approach, Mayer's group have created various lipid bilayer coatings for synthetic nanopores to improve their sensing ability. In tests, the researchers found that the coatings could capture proteins even from dilute solutions, could discriminate between different molecules, and could alter the speed of a protein's passage depending on the coating's viscosity. 'It enables, for the first time, the capture, concentration and translocation of molecules in a quantitative and predictive fashion,' says Mayer. Salvador Mafé, another expert in nanopores at the University of Valencia, Spain, says several other research groups are also looking for inspiration from nature. 'The results appear to show a promising avenue towards practical devices, although future studies should also address the nanostructure stability and performance in different chemical environments,' he adds. The way that we digest fat could be controlled by food design, providing potential health benefits, according to scientists from Australia. Fat is an essential part of our diet, but too much of it can lead to problems such as heart disease and obesity. The digestion of fat is also involved in triggering the hormone signals that tell us whether or not we are full. Reducing fat intake in meals is often negated by overeating, so designing food that controls fat absorption is of great interest. 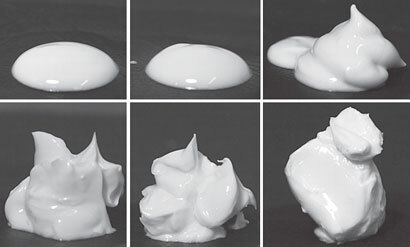 Researchers at the Commonwealth Scientific and Industrial Research Organisation (CSIRO) Food and Nutritional Sciences designed fat emulsions using different surfactants, including protein, phospholipids and common food additives, and monitored how their structures changed during simulated digestion. They also gave the emulsions in a drink form to healthy volunteers and monitored blood triglyceride levels, which give an indication of how the fat is being digested by the body. The team at CSIRO hope to build on their results to further probe biochemical responses to fat digestion. A follow-up clinical trial has already been completed and there are plans to try out the emulsion designs in more complex food structures. A protein has been identified as a possible indicator of recurring pregnancy loss by scientists from Korea. 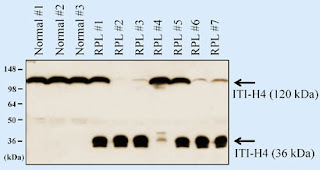 Kwang-Hyun Baek from CHA University, Seoul, and colleagues found that ITI-H4, a protein found in the blood whose function is unclear, was fragmented in the blood samples of patients suffering from recurrent pregnancy loss (RPL). 'RPL is the loss of at least three consecutive pregnancies after 20-28 weeks,' explains Baek who adds that over half of the possible causes are unknown. 'We have seen a number of patients suffering from RPL without knowing the cause,' he says. To look for differences between RPL patients and patients with no pregnancy complications, the team compared their blood samples. They used electrophoresis - a technique that uses an electrical field to manipulate charged particles - to separate mixtures of proteins in the blood and examined the separated proteins spectroscopically. They found that a fragmented form of a protein called ITI-H4 was present in the blood of patients with RPL, but not in the control samples. 'ITI-H4 can be used to detect RPL patients by simply screening for the proteins' presence in the blood,' says Baek. 'There is an enzyme that will clip ITI-H4 to give the fragments they are detecting. There must be an increase in the enzyme's activity with the miscarriages,' says Rodney Geisert, who studies reproductive physiology, in particular uterine function, maintenance of pregnancy and embryonic loss in pigs at the University of Missouri, US. 'This enzyme activity is something we see in pregnant pigs and we could compare that to humans, but it's a different type of placentation.' He suggests that the enzyme could be plasma kallikrein, which cleaves peptide bonds in proteins. Geisert adds that there isn't much literature about the function of ITI-H4, but he says that the molecule has a lot to do with binding and adhesion. In the pig, it forms the attachment between the placenta and the uterus, he says. A simple analysis of hydrogen bond strengths finds the best crystallisation partners for drugs, say UK scientists. The properties of active pharmaceuticals can be altered by crystallising them with an inactive partner molecule in a cocrystal. Finding good cocrystal partners experimentally is time consuming, and current computational methods are laborious as they calculate the crystal structure, atom by atom. Cocrystals could provide new ways to deliver drugs and improve their properties, so the search for them is on. Hydrogen bonds and other electrostatic interactions influence how molecules interact, and the energies of such gaseous interactions are straightforward to calculate. Chris Hunter and colleagues at the University of Sheffield, UK, University of Barcelona, Spain, and AstraZeneca, UK, assumed that these interactions don't change in a solid crystal and that the crystal packing is less important than electrostatics. These are controversial assumptions but the calculations based on them work. 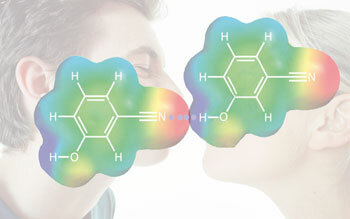 The team calculated the strength of each interaction site in both active and partner molecules. They paired the best interaction sites, the second best, and so on, to rank interaction strengths and relative contributions to the cocrystal. This procedure gives a picture of molecular interactions within the crystal, without needing to know the exact structure. The researchers tested their method on 1000 food additives and calculations predicted many good known cocrystals and likely candidates for new ones. Bill Jones of the University of Cambridge, UK, who has extensively researched cocrystals for pharmaceutical development, thinks: 'we need to maximise the ways to get cocrystals of a drug candidate from a library of partners. This method is quite attractive and the calculations look doable for drug-like molecules.' He looks forward to seeing what pharmaceutical companies make of this development. Adding a small amount of an immiscible fluid to a suspension - solid particles dispersed in a fluid - tunes the consistency of the suspension. The method could be used to create low-calorie foods, say the researchers in Germany. Controlling the flow or viscosity of suspensions is necessary to make various products including building materials, paints, and even food. Traditionally, surfactants or polymers are added which bind the particles together to stabilise suspensions. However, these can have environmental implications and add complexity and expense to the overall manufacturing process. A cleaner approach is to add an immiscible fluid to the suspension to produce a gel-like consistency - the secondary fluid preferentially wets the suspended particles causing capillary forces to create networked clusters of particles connected by pendular bridges. Erin Koos and Norbert Willenbacher at the Karlsruhe Institute of Technology, in Germany, have now found that only very small amounts of a secondary immiscible fluid are required to achieve this. The team first dispersed hydrophilic glass beads in an organic solvent, diisononyl phthalate, and then added one weight per cent of water as a secondary fluid. By stirring the mixture, the viscous suspension changed to a gel-like liquid, confirming that the secondary fluid preferentially wets the particles. They then repeated the experiment with hydrophobic glass beads, preventing the secondary fluid preferentially wetting the beads. Even when a secondary fluid does not preferentially wet the particles, capillary action still caused the suspension to become more gel-like. 'We would think of a non-wetting fluid pushing the particles farther apart rather than together, but the agglomeration of particles around the preferentially non-wetting fluid is quite strong and energetically favourable,' says Koos. Koos is now working to see how the technique could be applied to create low-calorie foods by replacing oils in food with water using just a small amount of oil to stabilise the mixture. 'Not only would this potentially make it a lower calorie food, but it would make the formulation a lot more natural by allowing us to add fewer emulsifiers to our foods or other products.' Koos adds. Sanofi-Aventis has won its long-running battle for Genzyme, and is to acquire the US-based biotech for $74 (£46) per share - about $20 billion in total - plus extra payments of up to $14 per share. The extra payments will depend on the success of the leukaemia drug Campath (alemtuzumab) in the multiple sclerosis (MS) area, where it will be marketed as Lemtrada, and production levels of the Genzyme products Fabrazyme (agalsidase beta) and Cerezyme (imiglucerase), which lost market share after being beset by manufacturing problems in 2009. Genzyme's shares peaked at $83 in 2008, but had dropped below $50 by the time Sanofi-Aventis made its first offer as a result of the manufacturing issues. 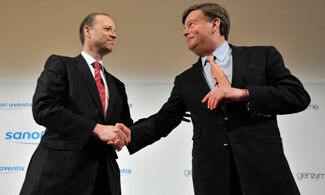 The French-headquartered company first bid $69 per share in August 2010, but Genzyme said it undervalued the business. Sanofi-Aventis hopes the deal will close early in the second quarter of this year, as no divestments will be required by the competition authorities in either Europe or the US. 'I think Sanofi-Aventis didn't have a choice - they started doing acquisitions knowing they had products such as Plavix going off patent,' says Jansen Jacob, an adviser at consultancy PharmaVentures. Concerns over the potential value of Lemtrada appear to be the big driver behind the $14 per share extra payments. Sanofi-Aventis was burnt by the Phase III failure in January of breast cancer treatment iniparib, the lead product of its 2009 acquisition, BiPar Sciences. 'The other issue is integration and whether Genzyme will be more or less left independent or not, as that might affect how innovative it is in the future,' he adds. A team of US scientists has developed the first lab on a chip device to be powered remotely. Wen Qiao at the University of California, San Diego, made a microfluidic chip that can be powered with a commercially available radio frequency transmitter for electrophoresis experiments. Electrophoresis is a technique that uses an electrical field to manipulate charged particles. To increase throughput, scientists have developed microchip devices, but they require bulky electrical equipment. 'One of the major complaints about microfluidics has been that, while the chips are quite small, the associated equipment is large. This work is truly revolutionary,' says Chuck Henry, an expert in electrophoresis at Colorado State University, US. Qiao's team made the chip by printing a circuit onto a plastic sheet. Within the circuit, they placed a chamber containing microwells. The team fed negatively charged nanoparticles into the chamber, which moved about randomly at first. When they induced an electric field with a radio frequency identification (RFID) reader, the beads became trapped in the positively charged wells. The reader transmits a radio frequency pulse, which induces an electric current to power the chip. 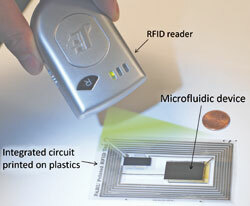 RFID readers are used to prevent theft in supermarkets. Produce is labelled with RFID tags, which contain information that is picked up by scanners. While this is an encouraging initial step, Qiao says that more work is required to develop devices that can be powered with a greater range of frequencies. The team now intends to design other microfluidic chips that will be capable of diagnosing diseases. Scientists in Singapore have found out how to produce coloured silk based on the diet fed to silkworms. The discovery has the potential to end the expensive and environmentally harmful methods currently used to dye silk fibres, and could also pave the way for luminescent silk scaffolds for use in medicine. Ming-Yong Han of the Agency for Science, Technology and Research and colleagues have fed silkworms various dyes, and examined the molecular take-up with fluorescence imaging and spectroscopic quantification. It has long been known that a silkworm's diet can affect the colour of the silk it produces. The mulberry leaves eaten by certain wild Thai silkworms, for example, turn their silk gold. But these natural colours are useless for making fabrics because the pigment is contained in the outer layer, a sticky gum called sericin. This layer must be removed to reveal the smooth, lustrous core known as fibroin, which contains no pigment. 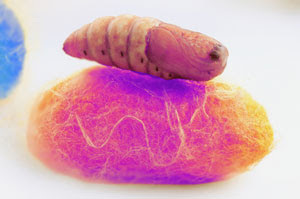 Researchers have tried feeding silkworms synthetic dyes to achieve coloured silk, yet these attempts have still failed to colour the fibroin core, until now. Pierre Couble, a researcher specialising in silk at the University Claude Bernard Lyon 1 in France, points out that the Singapore researchers' paper does not mention how stable the pigments are over time. 'It may be very poor because silk's protein-pigment interaction is likely very weak,' he says. Han's team says that diet-based pigmentation has several benefits. On one hand there should be no need for the traditional methods, which often involve masses of dye, chemicals and energy. On the other, luminescent silk fibres could be used to create bio-compatible scaffolds for the growth of artificial blood vessels, ligaments and other structures in medicine. 'We are open to discussing the possibility of commercialising this invention,' says Han. Cleaning products and lubricants containing nanomaterials will be allowed carry a logo indicating that they are environmentally friendly, following the agreement on 11 February of criteria for the European Union's Ecolabel scheme. The Ecolabel scheme operates across the EU, covering thousands of products in various product groups - including electronics, clothing and buildings - for which specific criteria are revised every few years. 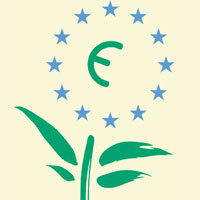 Its stamp of approval is a flower logo that signifies a product is 'kinder to the environment'. Early drafts of criteria for a group containing all-purpose cleaners, washing-up liquids and lubricants had excluded products containing nanomaterials. But in the final version approved by the scheme's regulatory committee the exclusion was deleted, allowing 'nanoforms' to be approved in the same way as other materials. Approval is dependent on satisfying certain information requirements - as a minimum, those specified in the Reach (Registration, evaluation, authorisation and restriction of chemicals) regulations. 'We're creating a high hurdle,' says Paul Vaughan of the UK Ecolabel delivery team. 'So if there is no information available, and in some cases there isn't for nanoforms of substances, then we wouldn't allow it to be included as an ingredient in the product.' The distinction between nanoforms and nanomaterials is important, he says, because the European Commission is still consulting on its definition of nanomaterials. Lukas Hammer, Ecolabel coordinator for the European Environmental Bureau (EEB) and European Consumers' Organisation, doesn't think the criteria go far enough. 'It's not a good signal to consumers that we allow substances in our label of environmental excellence where we basically have no clue what effects they have on environmental health,' he says. Hammer claims the agreement is the result of 'political resistance to blacklisting of nanomaterials,' but his major concern is that the final text is too vague and will lead to different interpretations in different countries. Another concern raised by the EEB is that for nanomaterials there are no agreed test methodologies to generate the information required by REACH. Steffi Friedrichs, director of the Nanotechnology Industries Association, doesn't think new test methods are required but says some existing methods for assessing ecotoxicity do still need be adapted. 'We are currently working on how the specific test guidelines need to be adapted to make all the parameters applicable to nanomaterials,' she says. However, she adds that regulating products containing nanomaterials will remain difficult until a definition is agreed, and may continue to be so, even after a definition has been set. The agreed criteria will now undergo a scrutiny procedure before legal adoption. US scientists have come up with a method that makes it easier to extract compounds that are difficult to isolate from crude natural product mixtures. Erin Carlson and her team at the University of Indiana, Bloomington, used resins to target and isolate desired compounds in crude extract mixtures, in this case alcohols. Isolating compounds from natural product mixtures is important because of their high propensity to interact with biological targets. Nearly half of currently available drugs are from natural products and pharmaceutical companies analyse crude extracts from, for example, plant materials for biological activity. Any active compounds are purified either by extraction and/or chromatography. Current extraction methods rely on the compounds' physical properties such as solubility, polarity or size. Despite advances in separation technology, purification is still problematic and time-consuming. 'Isolation of trace quantities of new natural products is often thwarted by the crude extract containing a plethora of compounds, with a heavy reliance on multiple liquid chromatography processes,' says Gordon Florence, an expert in bioactive natural products from the University of St Andrews, UK. Carlson's team used a silyl-functionalised resin to capture and bind to the alcohol anisomycin - a protein biosynthesis inhibitor - from a mixture of compounds extracted from soil bacteria Streptomyces griseolus. The team washed the resin to remove non-targeted compounds before cleaving the anisomycin from the resin and found that the resin didn't bind to compounds with functional groups other than alcohol. Following regeneration, the resin could be reused. In the future, Carlson aims to build up a large toolkit of functional-group targeting tags. She believes that 'generating a large library of tags will provide an essential insight into the use of reversible, chemoselective reactions in other applications.' These applications could include synthetic scavenging, isolation reagents and metabolomic profiling. 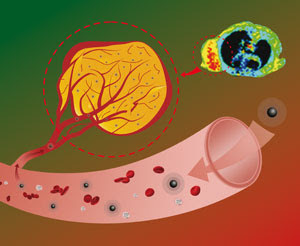 A new highly sensitive nanoparticle contrast agent for imaging in the body stays in the bloodstream longer and is better at targeting tumours than other nanoparticle contrast agents, say Chinese scientists. Xintao Shuai from Sun Yat-Sen University, Guangzhou,and colleagues encapsulated individual - or nonclustered - superparamagnetic iron oxide nanoparticles inside micelles composed of folate and a polymer. The team injected the nanoparticles into the veins of mice tails and followed their progress with magnetic resonance imaging (MRI). They found that the micelles increased the nanoparticles' ability to show the bright and dark contrast between healthy and diseased tissue. The nanoparticles stayed in the bloodstream longer than larger nanoparticles because it took longer for them to accumulate in the liver. By introducing folate, the nanoparticles' ability to target tumour cells was also increased. 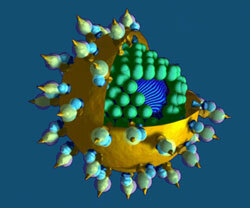 Similar imaging agents are made from clusters of nanoparticles inside micelles, but clusters are larger, limiting their use. As Shuai's micelles encapsulate the nanoparticles individually, they are smaller and more versatile. Shuai says the next step for these encapsulated nanoparticles is to achieve an even higher sensitivity and to carry out preclinical studies, including studies on the pharmokinetics and long term in vivo toxicity. One future challenge will be to extend this strategy to the detection of other tumours with different biomarkers, he adds. Scientists in the UK have developed a compound to combat the hepatitis C virus that could be taken as a pill. David Pryde and his team from Pfizer Global Research and Development, Sandwich, have made new compounds to activate a protein in the immune system called TLR7 - toll-like receptor 7 - which fights the infection. Toll-like receptors identify foreign DNA, such as a virus, and produce proteins that inhibit the virus' replication. 300 million people suffer from hepatitis C worldwide. The virus that causes the disease resides in the liver and can lead to cirrhosis, with some sufferers requiring liver transplants. Current treatments only cure half of patients and are administered intravenously. Recent research has focused on increasing the effectiveness of the drugs and on developing oral treatments. When they tested the compounds against a hepatitis C cell line, the team found that one of the compounds, a trifluoromethyl derivative, was highly selective for TLR7. The agonist also had comparable performance to injected alternatives at doses below 50mg. 'Medicinal chemistry is often castigated for surrendering synthetic elegance in order to gain compound access. Pryde elegantly repudiates this, accomplishing both elegance and access,' says Adam McCluskey, an expert in drug design and discovery from the University of Newcastle, Australia. Pryde and his team hope to make the agonist more soluble and to increase its potency further before moving on to human trials. US researchers have created a graphene-based device that guides electrons through the material in the same way an optical fibre guides light, using electrical gates. The work suggests new ways to create electrically reconfigurable wiring in future graphene-based electronic devices. Graphene is a single layer of carbon atoms arranged in a hexagonal lattice and is an excellent conductor, making it a promising material for high speed electronic devices. However, controlling how electrons behave within the material - crucial for making useful devices - has remained a challenge. The device created by Charles Marcus and his team at Harvard University in Cambridge, Massachusetts, uses electronic 'gates' to tweak the electronic properties of the graphene. By applying different voltages to the gates, using electrodes on a slice of graphene, the team were able to control the electronic equivalent of refractive index to create a channel and guide electrons in the material. 'Fibre optic cables are a ubiquitous element of modern optics. Electrons in graphene behave in a similar way, so we built a fibre-optic like device and it worked,' says Marcus. 'But what doesn't exist in optics are p- and n-type materials,' he adds. P-type semiconductors transport positively charged 'holes' whereas n-type materials transport electrons. Interfaces between the two types of material - called p-n junctions - are the elementary wiring components of most semiconductor electronic devices including transistors, solar cells and LEDs. Marcus suggests that the work could allow for reconfigurable wiring in graphene. 'It's a way of defining the location of wires electrically, instead of lithographically. Any region has the potential to be part of the wiring,' he says. Pereira is excited about this prospect: 'Imagine a chip or an electronic circuit whose wiring and different elements can be changed or created on demand, in real time, without actually physically changing anything within it,' he says. UK researchers have used a cage-like molecule to smuggle metal ions into cells, which could improve medical imaging. Medical imaging often requires getting unnatural materials such as metal ions into cells. Scientists have therefore had to come up with ways to disguise these compounds to get them past the cell membranes. Michael Coogan and colleagues at Cardiff University have come up with a way to avoid the current difficulties with some of these imaging treatments. Metal ions or other luminescent compounds are usually bound up in a lipophilic (fat loving) ligand to get them past the cell membrane. By using an excess of the ligand, it's possible to ensure that none of the toxic (and often expensive) metal is left behind. However, this requires a time-consuming purification step, as too much of the ligand can often be harmful in its own right. Coogan and his team have come up with a way round this problem. 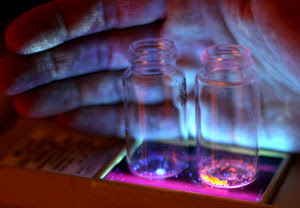 In the course of their work on fluorescent metal complexes, they found a neutral cage-like molecule that became positively-charged when it incorporated a metal ion. They realised that this could be very useful for medical imaging, because the combination of a lipophilic ligand and a positive charge is known to make it easier for complexes to get through cell membranes. The team describes this concept as a 'sleeping Trojan horse', alluding to the fact that the ligand is only able to enter cells (or 'wake up') when the metal is complexed inside. 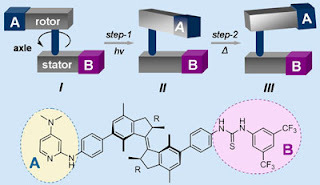 ­­The polypyridine ligand they've investigated can carry copper ions, so by using the isotope 64Cu, says Coogan, it could be used both for fluorescence detection and as an imaging agent for positron emission tomography (PET). 'Vancomycin-resistance is a serious concern because vancomycin is the last resort drug in the treatment of bacterial infections [such as methicillin-resistant Staphylococcus aureus (MRSA)],' explains Arimoto. Vancomycin works by inhibiting the synthesis of the bacteria's cell walls so the team investigated how the dimer form affected cell wall synthesis in vitro. They found that both inhibited the synthesis, but their modes of action were different. Vancomycin inhibits the synthesis of peptidoglycan - a polymer that forms the cell wall - by attaching to its precursor molecule, whereas the dimer inhibits the polymerisation step in the peptidoglycan synthesis. 'The inhibitory effect of these dimers on bacterial cell wall synthesis hadn't been addressed,' comments Jieping Zhu, an expert on the medicinal chemistry of vancomycin at the Federal Polytechnic School of Lausanne, Switzerland. 'So the finding that vancomycin dimers exhibit antibacterial activity against VRE through the suppression of cell wall synthesis is truly remarkable and marks an important step for understanding the precise mode of action of these compounds,' he says. Scientists in China have developed a device that can produce hydrogen from organic materials using bacteria at temperatures below 25 degrees Celsius. Normally, hydrogen production by bacterial metabolism is reduced at lower temperatures because it slows down the enzymes that catalyse the reactions. Now, Defeng Xing and his team at the Harbin Institute of Technology have optimised hydrogen production from organic matter between 4 and 9 degrees Celsius by using a microbial electrolysis cell (MEC). This eliminates the cost of heating and could enable hydrogen production to be carried out at high latitudes and mountainous regions where the air temperature is below 10 degrees Celsius. MECs generate hydrogen directly upon applying an electric current to bacteria. Bacteria consume acetic acid, which is produced from fermenting plant matter and release protons, electrons and CO2. Addition of an electric current enables the protons and electrons to join together to make hydrogen gas and the higher the current, the more hydrogen is produced. 'In order to achieve a high yield of hydrogen in MECs, it's essential that both the electron transfer and hydrogen recovery processes are highly efficient,' explains Xing. Methanogenesis, or methane formation, is a common problem in MECs, which occurs at higher temperatures as a result of bacterial anaerobic respiration. 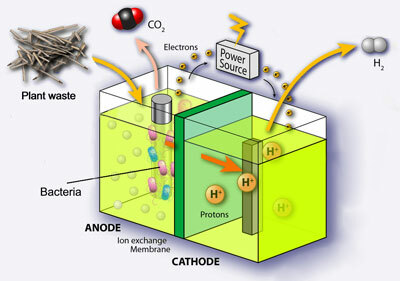 This can reduce the efficiency of electron transfer to the cathode, reducing the overall output of hydrogen. However, at temperatures below 10 degrees Celsius, no methane was produced since the growth of the methane producing organisms was inhibited and the yield of hydrogen produced is comparable to that at temperatures above 25 degrees Celsius. Sarah Strycharz-Glaven, an expert in microbial fuel cells at the Naval Research Laboratory in Washington DC is impressed with the group's findings but acknowledges that there is some progress to be made. 'The authors will need to increase the efficiency of hydrogen production under colder conditions to compete with MECs operating at ambient conditions,' she says. The group aim to do this by increasing hydrogen recovery and exploring new electrode materials. In the future they hope that MEC technology could be considered for biohydrogen production in cold environments. Scientists in the US have made a system that rapidly detects both explosives and nerve agents, providing a simple yes-no response. The technique could replace two time-consuming tests that are currently used to assess these threats. Joseph Wang and colleagues from the University of California, San Diego, combined their expertise in threat detection and electrochemical biosensors with the biocomputing experience of Evgeny Katz from Clarkson University, Potsdam, NY. The team produced an enzyme-based logic gate with the ability to simultaneously detect both nitroaromatic explosives and organophosphate nerve agents. The team fed 2,4,6-trinitrotoluene (TNT) and the nerve agent paraoxon into the system, in which a series of reactions catalysed by four enzymes takes place. The products of these reactions deplete hydrogen peroxide, which is used to indicate the presence of one or both threats. H2O2 levels exceeding a selected threshold indicate 'safe' situations, while levels below the threshold value signify a 'hazardous' situation. Escalating threats of terrorist activity have led to urgent demands for innovative devices to provide on-site detection of chemical and biological agents, as well as explosive materials. The pressure is therefore on scientists to develop faster, more reliable and portable sensing technology to detect as many threats as possible and to alert the operator when a hazard has been encountered. 'This study shows that the interface of biology and computing delivers a new class of simple, low cost and reliable analytical devices,' says Lars Angenent, an expert in bioelectrochemical systems at Cornell University in the US. 'This is exciting innovative work and I'm looking forward to seeing other important applications for this technology,' he concludes. Scientists from the Tokyo Medical and Dental University and Sony Corporation made a nucleic acid amplification testing (NAT) device that not only gives information on the sample's genetic make up to identify the flu pathogen type, but is also more than 90 per cent accurate. The device works by detecting the genes of the influenza virus pathogen - an organism that causes the disease - which gives information about the virus subtype and drug resistance. Current rapid diagnostic kits to detect the flu virus suffer from low accuracy (40-69 per cent) and don't provide genetic information about the sample. One NAT in use to test clinical specimens is real time reverse transcription polymerase chain reaction, which involves amplifying, detecting and quantifying DNA sequences. It does give genetic information, but it consists of a complex procedure and takes 3-4 hours to produce results. 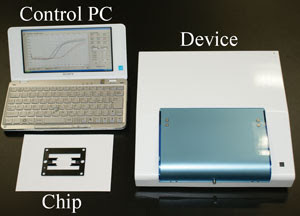 Sony's detection system comprises: a laptop to control the system; a device for heating samples and detecting fluorescence; and disposable testing chips. The chips contain reaction wells made of polydimethylsiloxane sandwiched between two glass sheets in a vacuum chamber. Samples are injected into the wells through a port by a disposable injector, eliminating the need for pumps and tubing. Loop-mediated isothermal amplification (LAMP) - in which a target sequence is amplified at a constant temperature - is then used to carry out nucleic acid amplification. The samples don't get contaminated because there isn't an outlet port and there's no need to purify samples, which is time-consuming, so results can be seen in 30 minutes. The team tested the system on swab samples from the throats of people with respiratory symptoms and found that it was comparable to results obtained from the real time reverse transcription polymerase chain reaction. 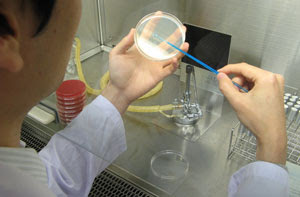 In the future, Abe hopes that the device will be used to test for other infectious diseases such as tuberculosis and HIV but also to run non-clinical tests, such as food tests. Space ice made from a mixture of methanol and water expands under pressure, and shrinks when heated - the opposite behaviour to most solids. Dominic Fortes at University College London, UK, is interested in the internal structures of icy moons like Saturn's Enceladus, which is thought to have an underground sea of water. But when measuring the properties of an ice-methanol system his findings were 'entirely unexpected' - the ice expanded with increasing pressure and shrank with heating. The oceans of icy satellites are likely habitats for extraterrestrial life. But to understand the chemistry and behaviour of these habitats, the ice has to be studied at different temperatures and pressures. 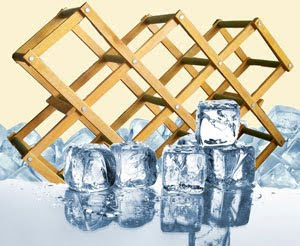 The ice's crystal structure acts like a collapsible wine rack - when compressed it expands outwards in one direction. Fortes decided to study the icy compound methanol monohydrate (a 1:1 methanol and water mixture) because scientists infer that the ice on moons will also have methanol present. This is because interstellar ice and comets, the leftovers of planet formation, contain small molecules like methanol. Fortes suggests that this negative linear compressability (NLT), the phenomenon of expansion under mechanical pressure, is because the methanol monohydrate crystal lattice is ordered like a collapsible wine rack - if you push down on the hinged points the lattice pushes outwards. This isn't the first substance that displays both NLT and negative thermal expansion (NTE) says Arnaud Marmier of the University of Exeter, UK, who studies these properties and describes them as 'weird, and quite fascinating'. Marmier doesn't expect the ice to be used in materials applications itself because it's too soft, but Fortes says he would be 'delighted if material scientists took up this material for further investigation'. A single molecule catalytic system that uses a light driven molecular motor to dynamically control the molecule's chiral states has been developed by scientists in the Netherlands. The team says it could be a useful tool for creating catalysts that can be controlled to perform multiple functions in sequence and adds to the potential applications for molecular motors. 'As far as we know this behaviour is unprecedented. It is usually very difficult to change the handedness of the product of a catalytic asymmetric transformation unless one uses the opposite enantiomer of the catalyst,' says Ben Feringa who conducted the work with Jiaobing Wang at the University of Groningen. Clockwise rotation of the rotor around the axle, by photochemically and thermally induced steps, controls the position and helical orientation of the catalytic groups A and B, providing sequentially I, II, and III with different activities and stereoselectivities. The team's system takes advantage of the unique dynamic stereochemical features of unidirectional molecular motors which can be alternated by light. By integrating catalytic functional groups into a motor, the team produced a system in which a single enantiomer can be triggered in situ to produce a racemate, one enantiomer or the other enantiomer of a chiral product, on demand. 'We can switch between three different states with distinct activity and stereoselectivity,' says Feringa. The sequence of events is dictated by the unidirectional nature of the motor. 'This means that by altering the rotary direction we alter the sequence in which the distinct catalytic states are reached,' he adds. Combining two Raman spectroscopic imaging techniques could offer a valuable tool for future disease diagnosis, say UK scientists. Surface enhanced Raman scattering (SERS) works by detecting spectroscopic signals of molecules such as cancer antibodies that are in close proximity to metals injected into tissue such as gold or silver nanoparticles. Nicholas Stone from Gloucester Royal Hospital and colleagues have combined SERS with deep Raman spectroscopy to enable non-invasive analysis of multiple antibodies for different diseases tagged to nanoparticles. The combination allows for the first time antibody detection to a depth of 50mm in tissue samples. Current methods using SERS and Raman spectroscopy are only able to detect nanoparticles at a maximum depth of 5mm. 'Light doesn't travel too deeply into tissues so it's hard to measure signals from deeper within the body,' explains Sanjiv Sam Gambhir, director of the Molecular Imaging Program at Stanford University, US. This limits the use of SERS in measuring breast tissue, for example, as mammography screening protocols generally measure signals through a tissue depth of 20 to 50mm. '[Stone's] work solves a limitation of Raman imaging by developing strategies to go from about 5 to 50mm depth penetration,' adds Gambhir. To demonstrate their method, Stone's team coated gold nanoparticles with four different Raman reporter molecules - molecules that give signals at specific wavelengths - and encapsulated them in a silica shell. They suspended them in water and injected them into a porcine tissue block measuring 20x50x50mm. The signals from each different nanoparticle were then used to produce a false colour image of their locations in the tissue. Being able to distinguish between different molecules like this means that the technique could be used to detect cancer, monitor treatment and chemosensitivity, provided that the target molecule is known. 'Cancer and other diseases of interest are complex and there is not a single marker which can be used to identify cancer or its susceptibility to treatment,' explains Stone. Stone now hopes to label the nanoparticles with a wider range of antibodies for use in practical applications. Provided that the nanoparticles' excretion mechanism is found to be safe when injected, Stone thinks that his approach could open up a window to more of the human body.